Finally, after two and a half years, I’ve reached #1 on the WWE Network’s 100 Best Matches To See Before You Die List! Yes, reviewing each match was the reason I started this blog in February 2014. Of course, I expanded into film and (occasionally) TV, but one night after seeing the WWE Network’s 100 Best Matches…List I decided to write about them. I probably could have done it in less than two years, even if I’d reviewed one match per week. But hey, life gets in the way sometimes (as does our natural proclivity for laziness…or mine at least!). 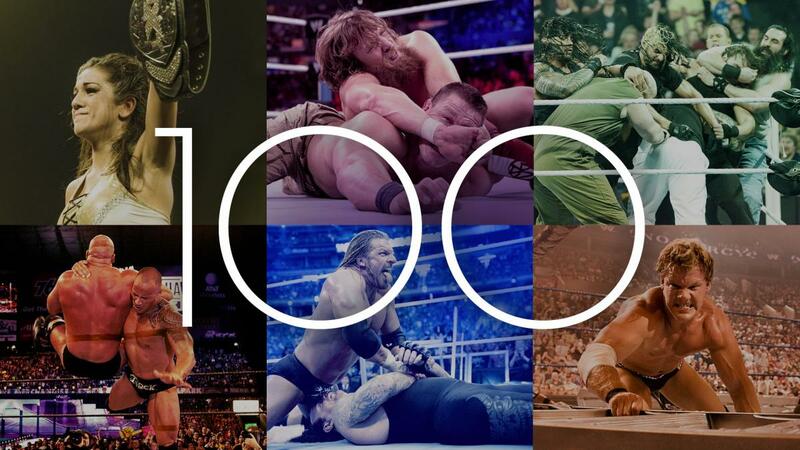 Unfortunately, earlier this year the WWE Network updated their 100 Best Matches…List, so after I review this one I’ll have to watch the matches added to the 100 Best Matches…List (click here for my blog explaining what happened). But, here we are at #1 (which doesn’t change on the original list or the updated one). To the surprise of few people I imagine, it’s The Undertaker vs Shawn Michaels from WrestleMania 25. If you’ve watched the 100 Best Matches…List from 100 to 1, then you’ll know the outcome of this match because the rematch at WrestleMania 26 is placed at #13 (click here for my review). But if you haven’t watched this match before, then I advise you to stop reading this and find the match on the WWE Network (or Youtube, I guess…!). I hate hyping things up, but HBK vs The Deadman is worth the hype, and worth the #1 on the 100 Best Matches to See Before You Die. The classic subjects of anything should be able to hold the attention of someone who hates the topic. For example, I hate musicals. But there are those musicals that I adore simply because they attain something incomprehensible, something that transcends the genre. Shawn Michaels and The Undertaker enraptured a person who hated wrestling (and presumably hadn’t watched it since the 90s). Saying something is a work of art is often hyperbole, but HBK and The Undertaker created a masterpiece, a work of art at WrestleMania 25. Yes, they feuded in 1997/98, where both were younger, more agile and quicker. But their maturity at Mania 25 allowed them to tell a story, and they wrestled like they were back in 1997. To be honest, I’d forgotten why they started to feud in the build up to ‘Mania 25. Sometimes, understanding the feud adds so much to the matches you watch. Here, however, all you needed to know was that two legends of the industry were fighting to prove who was the best. Yes, there was something about HBK representing the light and Taker representing the darkness (just look at their entrances), but you can watch this match without understanding why they’re fighting and appreciate it all the same. This is the epitome of psychology, storytelling, emotion inside the squared circle. I could tell you about the high spots of the match, or the near-falls, or the counters, or the mid-way suicide dive that I mentioned earlier that looks as if Taker has broken his neck. I could tell you that out of The Undertaker’s Streak of undefeated matches, this is the closest you’ll come to believing HBK will defeat the Streak. I could tell you how me and my brother applauded after the match, how we laughed at my friend saying he nearly fell off his chair but we were actually close to falling off our chairs. I could tell you about the goosebumps on my arms, or describe my facial reactions from the opening bell to the closing bell. But that wouldn’t do this match justice. No words could. They had the weight of carrying the WWE for almost two decades resting on their shoulders. They threw this weight off and showed all the wrestlers backstage how to attain perfection inside the squared circle. I’ve watched this match time and time again, and I can’t find fault with it. Before ‘Mania 25, I didn’t believe that it was necessary to have HBK and Taker fight each other, when they could have fought other opponents who needed a boost. I wasn’t looking forward to it. But they put on the best match that I have ever seen. It has everything a classic match consists of and more. VERDICT: 11/10. Yes, it’s silly putting 11/10, but that’s how I feel about HBK vs Undertaker from Mania 25. I’ve watched it over and over again, and feel like I’m watching it for the first time each time. The Undertaker vs Shawn Michaels truly deserves the #1 spot on the WWE Network’s 100 Best Matches To Watch Before You Die List. Previous Article HAMMY’S TOP 10…NINTENDO 64 GAMES!!! Next Article HAMMY’S TOP 10…WORST FILMS OF ALL TIME!